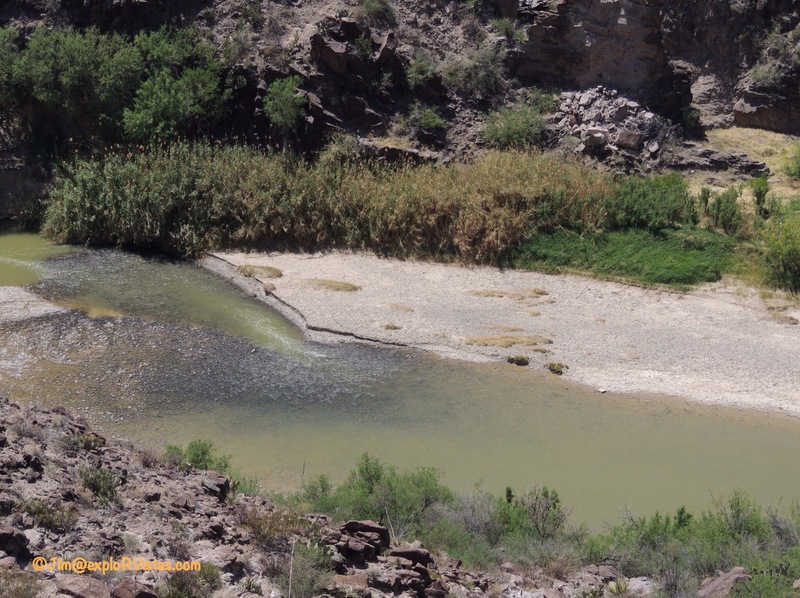 Our final installment on Big Bend features the stream that gives the park its name: the Rio Grande River. Winding its way from the base of Canby Mountain in south central Colorado, the river flows south and east for nearly 1900 miles to the Gulf of Mexico. The entire Texas / Mexico border is defined as the deepest point of the channel as it flows between them. As the Rio Grande comes through Santa Elena Canyon, it turns southward around the Chisos Mountains. Not long after, the river turns back north around the Sierra del Carmen Mountains. It is this huge sweep that is referred to as ‘The Big Bend’. 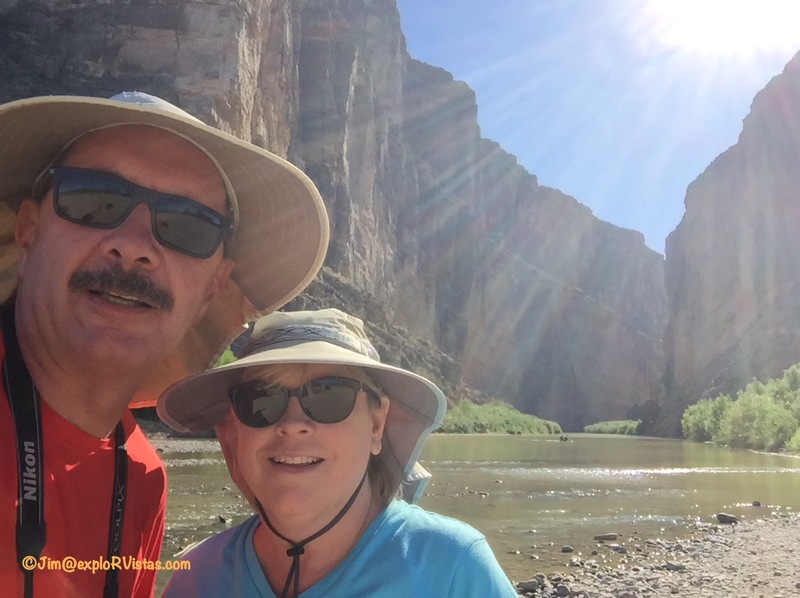 Our first introduction to the Rio Grande was at Santa Elena Canyon. We traveled there on April 3rd. 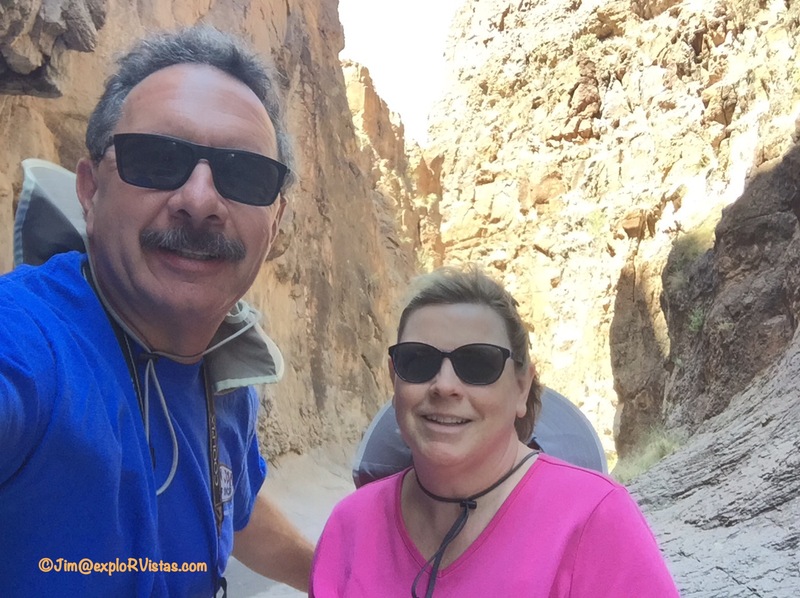 That’s Mexico directly behind us, with the U.S. side of the canyon to the right. The mesa walls are gigantic! If we had wanted to, we could have walked across and not gotten our knees wet. So much water is taken from the river for irrigation over its length, barely 20% makes it to the Gulf. 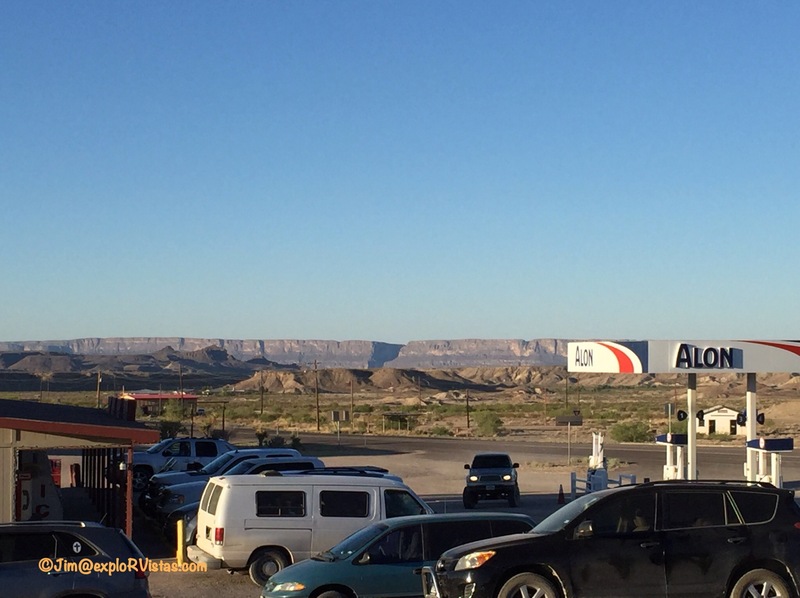 On April 7 and 8, we drove west from our campsite to Big Bend Ranch State Park. 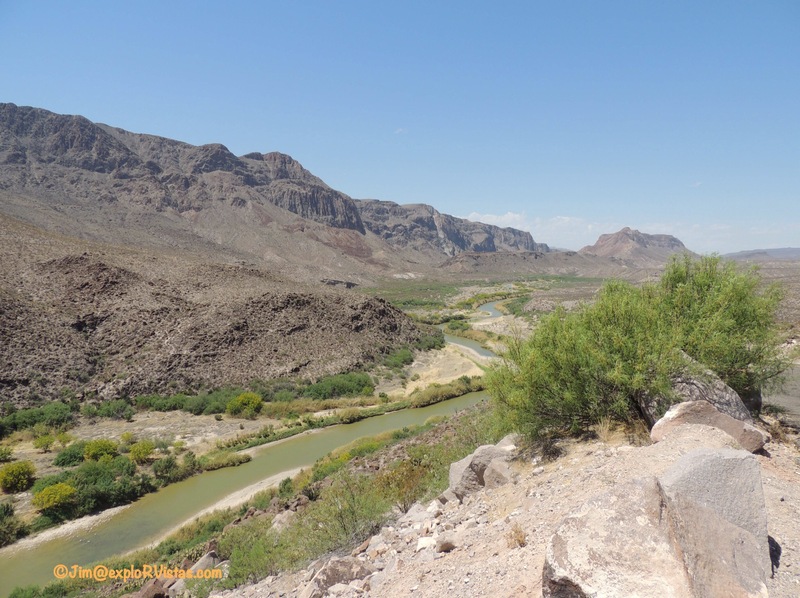 Totally seperate from the national park, Big Bend Ranch State Park is also a series of open range cattle ranches. 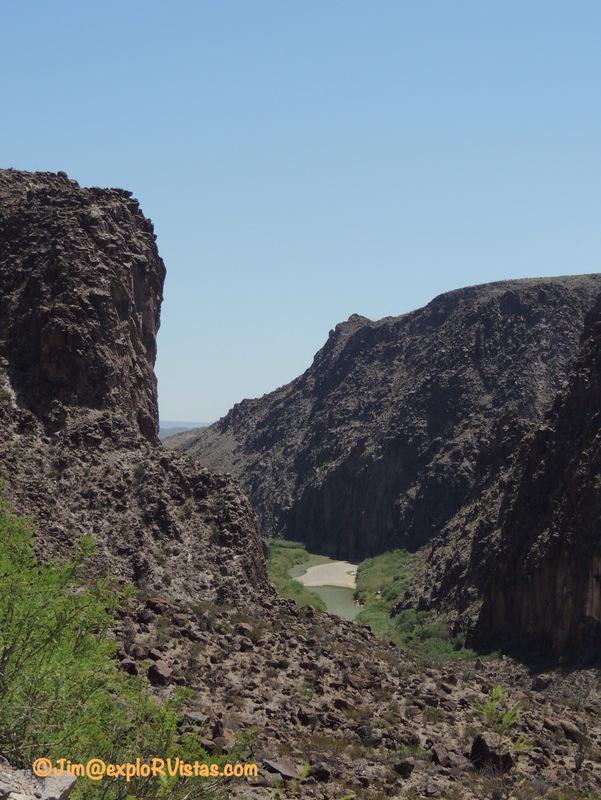 It encompasses 311,000 acres and 23 miles of Rio Grande river frontage. The first day was a driving tour as far as the town of Presidio, as our feet were still very tender from the 12 mile South Rim hike the day before. 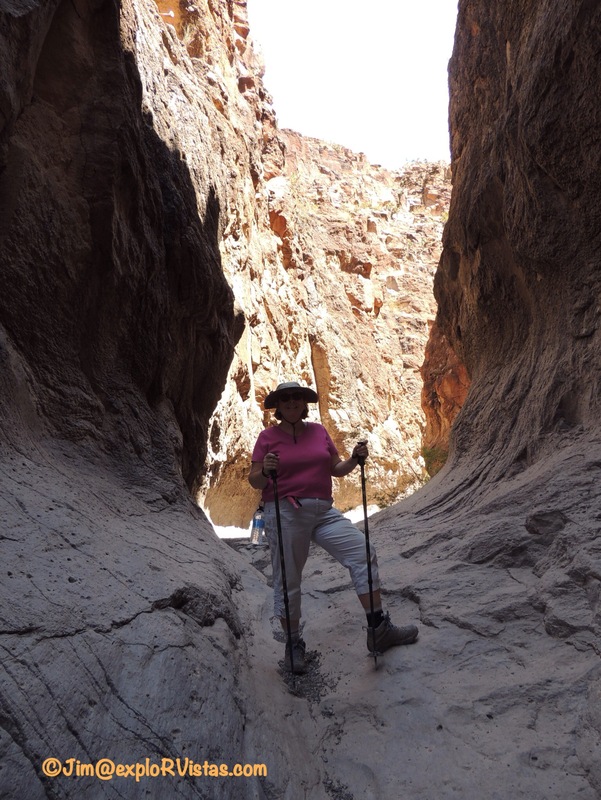 On that trip, we spotted Closed Canyon, and Diana encouraged me to lace up the hikers and check it out the next day. 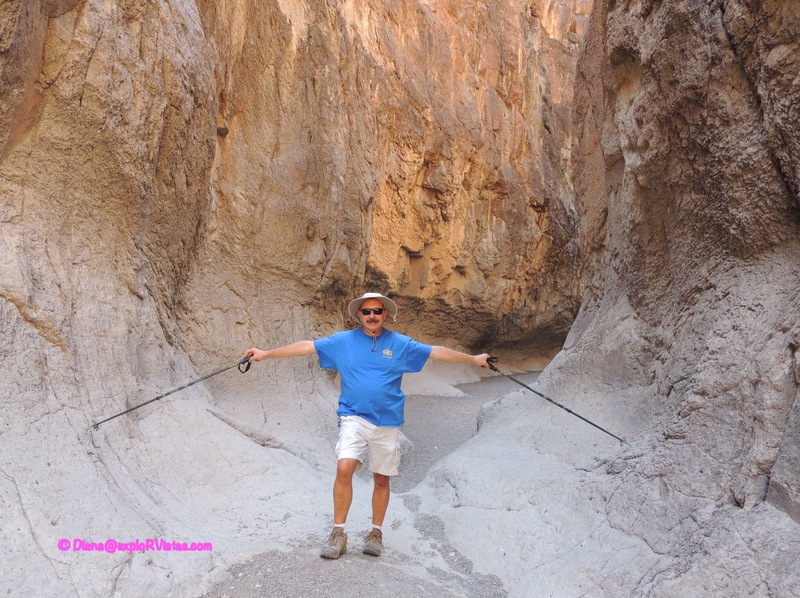 Closed Canyon was a hike I was first introduced to by Steve and Mona Liza Lowe of Lowe’s RV Adventures when they wrote about it in 2015. A narrow slot canyon that is dry most of the year, Closed Canyon empties runoff from the desert into the Rio Grande. It was a cool and shady spot to be on a hot day! The farther we went, the narrower it got. Definitely not the place to be if rain is in the forecast! A little to the east is a spot along the road that is referred to as ‘the big hill’. It’s a good place for a view of the Rio Grande. 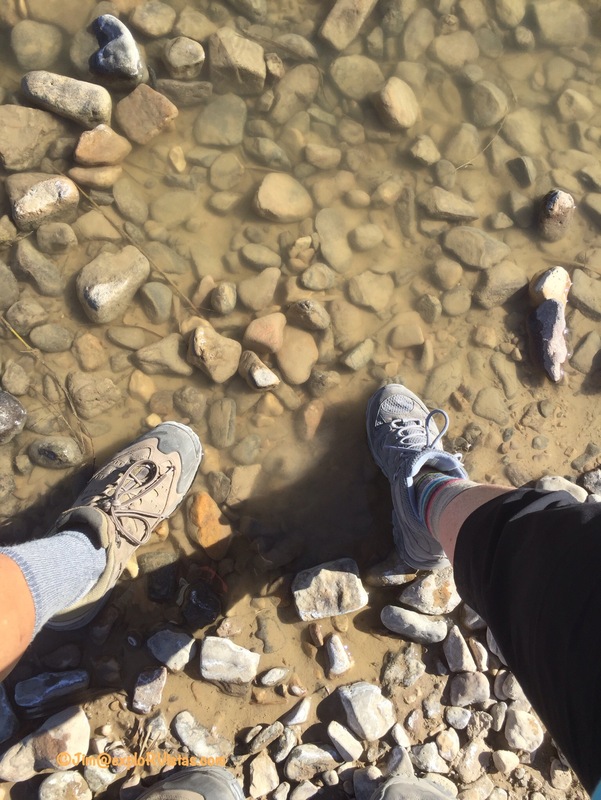 Forget getting our knees wet; we could keep our ankles dry here! After that, we headed back into the national park towards Boquillas Crossing. We wanted to see that area of the park before calling the week a wrap. Boquillas Crossing is unique in that they take you across the river to Mexico in a rowboat…or you wade to the other side. No bridge to be found anywhere in sight. The town of Boquillas, Mexico is miles from Mexican civilization, and is almost totally dependent on the U.S. tourist trade. 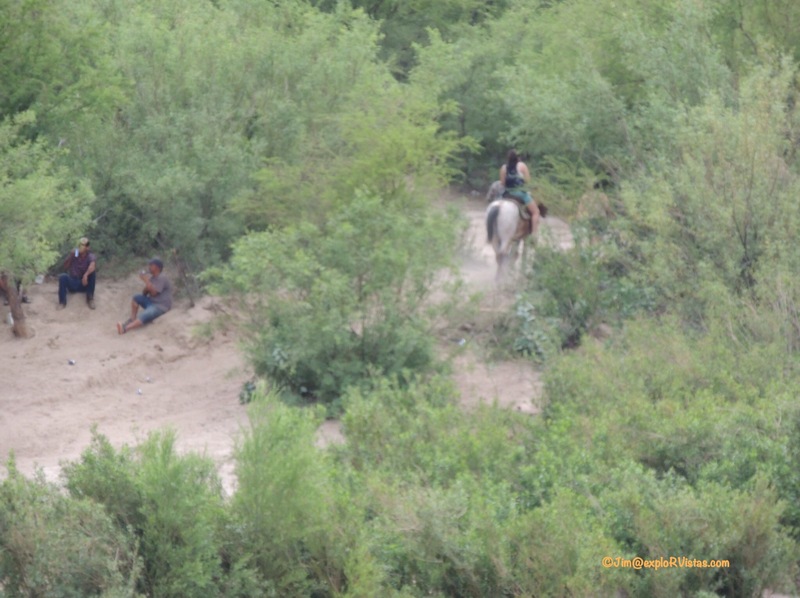 The border is only open back into the U.S. from Wednesday through Sunday, 9 AM to 6 PM. This trip, we knew very little about the crossing, so we chose not to go across. We probably will if we go in the future, as it is so unique. 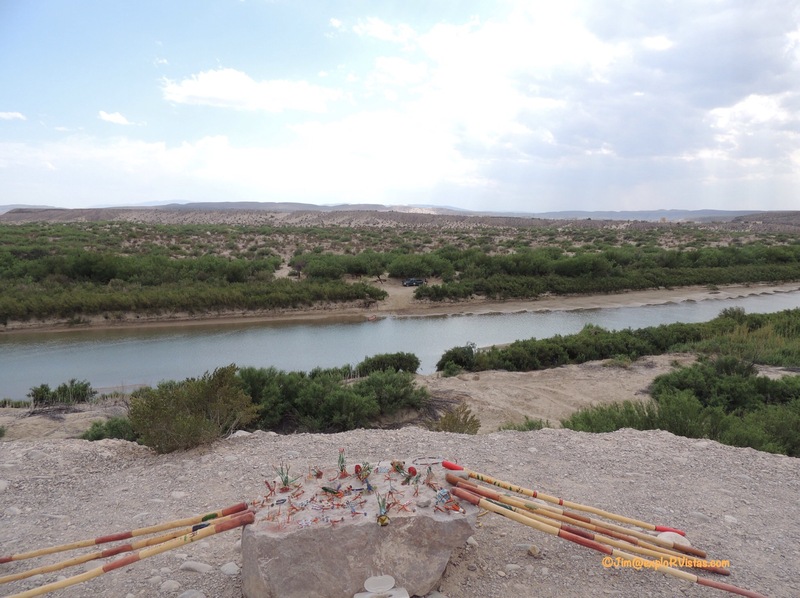 For a great write up on the Boquillas experience, visit Nikki and Jason Wynn’s blog here. …and the folks on the other side would find their way over to retrieve it. It is illegal to purchase these products, so we chose not to. But we didn’t see any U.S. park rangers confiscating this display either, so it seems they look the other way. That ends our trip to Big Bend. We hope you enjoyed the journey! explorRVistas is a participant in the Amazon Services LLC Associates Program, an affiliate advertising program designed to provide a means for sites to earn advertising fees by advertising and linking to Amazon .com. Shopping here doesn’t add anything to your cost, but it does help support this blog. Thank you for shopping through exploRVistas! Gotta love those slot canyons, each one is unique in upon itself. You could hike a hundred of them and have a different experience each time. Thanks, Pam! That was our first slot. The breeze was a bonus! That’s really interesting that there is a craft honor system. Never seen anything like that and suprised it works.